Ensure that your gifts are meaningful and memorable by giving your loved ones and friends the perfect present: the gift of relaxation. 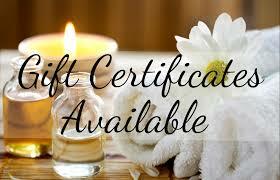 Bodywork gift certificates are appropriate for any occasion..a gift that always fits. Massage will leave them feeling pampered and peaceful. Subscribe to our monthly newsletter and receive new updates on the benefits of massage therapy and special discounts on massage services. Directions: From Governor's Drive, turn left onto Monroe Street (beside Checker's). Turn right onto St. Clair Avenue (in front of library). Go 1 block down, 600 St. Clair Avenue Complex is on the left. We are in Building 9 (the last building on the left) Suite 25. Gift Certificate Purchase Form. Please make sure you include the complete mailing address, and indicate if you would like to include a gratuity/tip on the service. Standard gratuities are 15 to 20% of the amount of service. 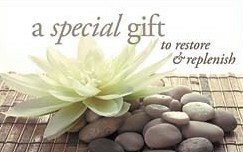 For returning clients, gift certificates will be assigned to the client's current therapist. For new clients, you can choose a therapist, see (Massage Therapist) tab. If a therapist is not specified, the recipient can choose a therapist when scheduling their service, or therapists may be assigned according to availability. Gift certificates will be processed and mailed to the recipient within 24 hours of submitting this form. You will receive an email confirmation of your purchase within 24 hours of sumbitting this form. If you do not receive an email confirmation, please call 256-738-3469 to check the status of your purchase. If you would like to have the gift certificate emailed to you instead, please specify by typing "email only" on the mailing address line. Please include 3 digit code from back of card for processing.